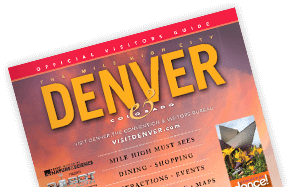 From the stately Victorian houses of Five Points to the hip restaurants and nightclubs of historic LoDo, Denver's laid-back attitude is exemplified in its neighborhoods. Explore the city on a B-cycle, Denver's pioneering bike sharing system. Denver really is exactly one mile high. Denver really is a mile high, but most people don’t even notice the altitude difference. The air is just thinner and dryer. In fact, many people with respiratory problems move to Denver for the benefits of the dry air. Follow these tips to stay happy and healthy. If you want to have a genuine high-altitude experience, check out these fun places. Before your trip to Denver, and while you are here, drinking plenty of water is the number one way to help your body adjust easily to our higher altitude. The low humidity in Colorado keeps the air dry, like the desert, so you need about twice as much water here as you would drink at home. In Denver&apos;s rarified air, golf balls go ten percent farther... and so do cocktails. Alcoholic drinks pack more of a wallop than at sea level. It is recommended that you go easy on the alcohol in the mountains and in Denver, as its effects will feel stronger here. Foods such as broccoli, bananas, avocado, cantaloupe, celery, greens, bran, chocolate, granola, dates, dried fruit, potatoes and tomatoes will help you replenish electrolytes by balancing salt intake. The effects of exercise are more intense here. If you normally run 10 miles a day at home, you might try 6 miles in Denver. With less water vapor in the air at this altitude, the sky really is bluer in Colorado. But there&apos;s 25 percent less protection from the sun, so sunscreen is a must. Denver receives over 300 days of sunshine each year (more than San Diego or Miami). Bring sunglasses, sunscreen, lip balm... even in winter. Two days before your trip to Denver, check the weather and use this information to pack appropriately. Because the sun is especially powerful in Denver, it can feel much warmer than the actual temperature during the daytime, but then become very chilly after sundown, particularly in the Spring and Fall. It is best to layer your clothing.